This lesson is designed for 8th grade science classroom. Duration of class: 60 min. I would start my lesson by asking the students to take 3 minutes and think about what they know on mining and its effects. Then using www.kahoot.it!, I would test their background knowledge with 5 questions about: mining- definition, mining- extraction methods ( images). 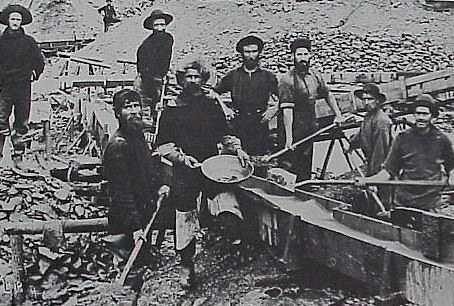 When did gold mining started in Southeast Alaska? Where do we find the gold? What other minerals can we find in Southeast Alaska? For this activity students will work in groups of 3 or 4. Question: Can you successfully mine for blueberries while not destroying the earth? Hypothesis: What are some techniques you are planning to use? Materials Needed: blueberry muffin, paper towel, toothpick, knife, other mining materials? Experiment: You will be given a muffin. The muffin represents a land area and the blueberries are valuable deposits. Your goal is to remove as many mineral deposits (blueberries) with the least amount of damage to the land. Inspect the land area for surface deposits and made predictions about underground deposits. Record the number of mineral deposits successfully removed. As a group, compare and average your data. Was your mining effort successful? How did you determine your level of success? How did the land areas change as a result of your mining? Can you successfully mine for blueberries while not destroying the earth? Explain. Oh man, I love this idea and it would be so much fun to do! I think that your lesson plan and activity for the students is great. If you wanted to take this even further, you could discuss different techniques of mining in different substrates, i.e. silt, sand, soil, sandstone, or granite. To add to the activity, you could have students mine for blueberries or other objects in the different stages of baking. Mining in pancake batter would be way different than mining in cookies, and therefore different methods would have to be used. This could also help bring in a discussion about the different techniques of mining and why they were used in different areas of Alaska. I think I am going to have to remember this one! Reuben, I appreciate your enthusiasm!!! Thanks for the idea with different substrates. I would love to do more experimentation with the students. I am wondering if I would have time to do it all in 60 min? This would be a great lesson for 2 periods. I LOVE the blueberry muffin idea! Going a little bit off what Reuben said, maybe you could have them try to design blueberry removal techniques that correspond to actual mining practices (which I don’t know much about, honestly, I just like the idea of them trying to fashion their own tools out of paperclips or straws, etc.) I’m also wondering if there’s a way to tie it into the effect on wildlife as well as land, or just how long-term the effects of mining are. Maybe with a larger scale cake? I don’t know, but I love your thought process so far! I don’t have much to add to what Reuben and Kluonie said but I just wanted to show some support for the muffin idea! I think it really helps bring the point home about the impact it has had on the land. What a great idea, Ioana! The blueberry mining is a very cool idea. It simulates impact of mining on the surrounding landscape. I’m wondering if you could show some real world examples of minings impact on the environment. Especially thinking of Salgado’s startling pit mining photos.